Crestshade is a village in western Rivenspire, west of Shornhelm. The village has been abandoned following an invasion of bloodfiends and a landslide from the Doomcrag. Crestshade Objective: Save Crestshade from the Argonian's blood curse. 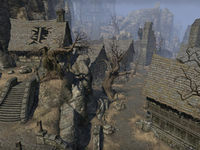 Crestshade Wayshrine is located in the north of the village, just below the steps of Ravenwatch Castle. This page was last modified on 3 January 2019, at 18:42.